Location in Litchfield County and the state of Connecticut. The Winsted post office contains an oil on canvas mural, Lincoln's Arbiter Settles the Winsted Post Office Controversy, painted by muralist Amy Jones in 1938. Federally commissioned murals were produced from 1934 to 1943 in the United States through the Section of Painting and Sculpture, later called the Section of Fine Arts, of the Treasury Department. In 1955, Hurricane Connie and Hurricane Diane passed over Connecticut within one week, flooding the Mad River and Still River through downtown. The Mad River, which parallels Main Street, caused flooding up to 10 feet deep through the center of town. This damaged the buildings between Main Street and the river such that all buildings on that side of Main Street through the center of town were subsequently removed and Main Street widened to four lanes. The buildings on the north side of Main Street for the most part survived and were repaired. Further downstream, the Still River flowed between the buildings of the Gilbert Clock Company. The flooding caused extensive damage to their buildings, and this was the final blow to a company which was already in poor financial condition. In 2013, Henry Centrella, the former city Finance Director, was served a complaint, which stated that over $2.2 million was misappropriated during his 30-year tenure. According to the United States Census Bureau, the CDP has a total area of 4.8 square miles (12 km2), of which, 4.7 square miles (12 km2) is land and 0.2 square miles (0.52 km2) (3.31%) is water. Winsted is at the confluence of the Still River and Mad River. This Mad River is one of seven rivers with the same name in New England, one other of which is also in Connecticut. The city is laid out in a horseshoe-shaped valley ringed by seven hills; two other hills stand amid this, making a total of nine named hills. There are five stone churches in a crescent from east to west, with the Soldier's Monument on Camp Hill in their exact center. 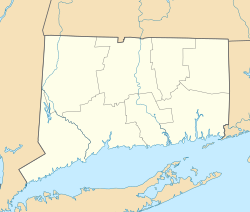 The city is crossed by U.S. Route 44, Connecticut Route 8, Connecticut Route 183 and Connecticut Route 263. As of the census of 2000, there were 7,321 people, 3,072 households, and 1,889 families residing in the CDP. The population density was 1,563.6 people per square mile (604.0/km2). There were 3,370 housing units at an average density of 719.7 per square mile (278.0/km2). The racial makeup of the CDP was 93.28% White, 1.53% African American, 0.23% Native American, 1.12% Asian, 0.01% Pacific Islander, 2.20% from other races, and 1.63% from two or more races. Hispanic or Latino people of any race were 4.02% of the population. There are 3,072 households of which 27.6% have children under the age of 18 living with them, 44.9% were married couples living together, 12.0% had a female householder with no husband present, and 38.5% were non-families. 31.3% of all households were made up of individuals and 14.0% had someone living alone who was 65 years of age or older. The average household size was 2.36 and the average family size was 2.98. In the CDP, the population was spread out with 23.5% under the age of 18, 7.6% from 18 to 24, 29.0% from 25 to 44, 23.4% from 45 to 64, and 16.5% who were 65 years of age or older. The median age was 39 years. For every 100 females, there were 90.0 males. For every 100 females age 18 and over, there were 86.7 males. The median income for a household in the CDP was $40,202, and the median income for a family was $51,044. Males had a median income of $37,837 versus $25,990 for females. The per capita income for the CDP was $19,804. 7.3% of the population and 4.3% of families were below the poverty line. Of the total population, 9.2% of those under the age of 18 and 7.9% of those 65 and older were living below the poverty line. The closest major airport is Bradley International Airport (BDL), outside of Hartford. Amtrak stations within a 30-mile radius include Windsor (WND), Hartford (HFD), Berlin (BER), and Springfield, Massachusetts (SPG). Greyhound Lines also has a bus station. The Connecticut Transit system operates a weekday bus service and a dial-a-ride service. ^ "Town of Winchester, Connecticut Government". Web page. Town of Winchester. Retrieved 11 August 2012. ^ a b "Town of Winchester web site". Web page. Town of Winchester. Retrieved 17 December 2011. ^ Although Winsted is recognized by the state as an incorporated city (it is listed as such in the State Register and Manual), it was removed from the rolls of Census-recognized incorporated cities sometime between 1970 and 1980. The Census Bureau decided to stop recognizing Winsted as an incorporated place because the city does not maintain a separate, active existence from the town of Winchester, and because the nature of its relationship with the town of Winchester makes it more of a special-purpose district than a general-purpose municipality. ^ "State of Connecticut Complaint". Web page. State of Connecticut. Retrieved 7 August 2013. ^ "Samuel B. Horne". Retrieved July 19, 2014. ^ "WAKEFIELD, James Beach, (1825 - 1910)". Biographical Directory of the United States Congress. Retrieved October 10, 2012.